We’re in the midst of a technological revolution, and as our technology quickly and remarkably evolves so, inevitably, does our day-to-day life - how we live, communicate, and work. Inventors and big tech companies are investing countless amounts of time and money into being the first to introduce the latest gadget or software to take-off and make them millions - before the next big thing is released roughly 24 hours later. This constant competition between corporations with loads of disposable income and man-hours is greatly altering the rest of society. Below we explain how this has affected the trade industry so far, and what’s still to come. They’ve been met by some controversy thanks to questionable use, but when used on construction sites, drones can revolutionise the project. Essentially flying robots, these machines can be used to survey construction sites, which then provides high resolution images, builds maps, and can be used to create 3D models. They’re great for giving you a full view of the project you’re about to undertake, and keeping you up-to-date with progress. They can also be used to take unique photos of finished projects to share for future business promotion. It’s now easier than ever to keep track of your tools - and protect them from thieves. Many manufacturers have now added new safety features to their tools to prevent this. Some are equipped with QR codes and barcodes, so they can be scanned to keep track of, and telematics systems that allow live monitoring of a machines location, usage and service requirements. 3D rendering softwares, such as BIM, have revolutionised construction projects and made planning and management much more efficient. With these softwares, you can easily create a digital 3D model of a project, to view how it will look before you even get started. This has saved loads of time on construction projects and also cuts down the risk of anything going wrong with stringent planning and calculations. So these aren’t common among tradesmen yet, but we’re sure they will be in the not-too-distant future. The exoskeleton is a piece of wearable robotic machinery, essentially a motorised metal frame worn around the body, they assist with repetitive and laborious tasks that would usually lead to fatigue, and potentially strain and injury. For example when repeatedly lifting heavy objects, the exoskeleton would support the lifting to ensure limited strain and effort is required from the wear. These will increase the weight that can be lifted, the speed of heavy-duty tasks and the amount of time that can be spent on these sorts of jobs. Plus more importantly, they will greatly reduce the risk of injury and repetitive strain. As the price of these begins to fall and they become more widely adopted among the trade industry, they’ll become a much more common sight on site. One of the biggest things to transform the trade industry is the introduction and growth of the internet. It has changed the way we do business, how we advertise, how we find clients, how we manage our appointments, how we buy materials and supplies, and how we leave reviews. Because of the internet and social media, it’s much easier for customers to publicly air their grievances and complaints after dealing with cowboy traders - this has its pros and cons for the industry, workers are now held accountable and the standard of work is up, customers can use the internet to help them find a good, reputable tradesperson, but it also means that one bad review, from something out of your control or a potential unreasonable client could tarnish your reputation. Read our post ‘How to use the internet to promote your trade business’ for our tips. Alongside the internet, we’ve seen smartphones take over our day-to-day lives, we use them as calendars, cameras, alarm clocks, radios, calculators, books, TVs - and sometimes we even make calls on them. These devices, and the accompanying apps, have changed the way tradespeople operate. 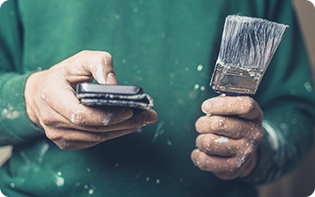 From ditching paper maps, always having a calculator, torch, and spirit level in their pocket, to easily being able to manage invoices and quotes (read our list of the top apps for tradesmen here). As new versions are released and the technology continues to evolve, it’ll be interesting to see what device they replace next - fingers crossed it’s the kettle! Whilst new technology is constantly changing the landscape of the trade industry, it’s always exciting to hear what the inventors and tech giants come up with next. What do you think about all of these changes? Let us know over on Twitter.